How to get here—by plane, directly to Lugano or in nearby Milan or Zurich; by train, directly to one of Ticino's main cities; or even by car, thanks to the comprehensive motorway network connecting every location in the canton. How to get around—you can travel throughout the territory with ease thanks to the extensive networks of buses, cable cars, and boats, or by car. Curiosities and useful informations are at your disposal to start discovering Ticino before leaving, but also to live it once you have arrived in Ticino. From hotels to camping sites, mountain huts or farm tourism, the Italian Switzerland has a wide range of accommodation to suit your needs! Whether by car, train or plane, Ticino can be reached easily. More information on how to travel in Ticino, the most Mediterranean Canton of Switzerland! Some useful information for planning your visit in Ticino are shown here below. Currency The Swiss franc is the monetary unit, usually indicated as CHF. Often is possible to pay in Euro, but normally the change will be returned in Swiss franc. Language Switzerland has four official languages: German, French, Italian and Rhaeto-Rumantsch. In Ticino the official language is Italian but it’s easy to find assistance in other foreign languages. VAT In Switzerland the VAT applied on the purchase of goods and services is of 7.7%. You may ask at the shops for your Global Refund Cheque and reclaim the VAT. For more information regarding terms and conditions refer to Swiss Federal Tax Administration. Phone area code The international area code for Switzerland is +41. Opening times Shops are usually open Mondays to Fridays from 8/8.30 a.m. to 6.30 p.m.. Some shops extend their opening hours on Thursdays to 9 p.m. On Saturdays shops open from 9 a.m. to 5 p.m. They are closed Sundays and on public holidays. Voltage The Swiss voltage is 230 Volt and the frequency 50 Hertz (for the domestic electrical appliance up to 2200 Watt). Kitchens, washing machines and etc use 400 or 3x400 Volt. The wall socket is of J type. 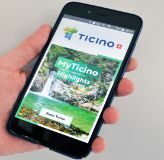 Discover Ticino with the apps! If you require any further help, you will find tourist information offices throughout the canton, but you will also discover that people you meet out will be happy to give advices and assistance. A list of the materials available for download to plan your trip in Ticino: brochures, information leaflets and hotels. More information for the disabled who visit Ticino.